On Friday, Bollywood superstar Salman Khan took to his Twitter handle and announced that the shooting for the second schedule of his upcoming movie Bharat has started in Malta. Earlier on Thursday, a picture of Salman with his family surfaced on social media in which Salman along with mom Salma and sister Alvira were spotted on Mumbai airport leaving for Malta. Salman Khan on Friday resumed the shooting schedule of his forthcoming movie Bharat in Malta. 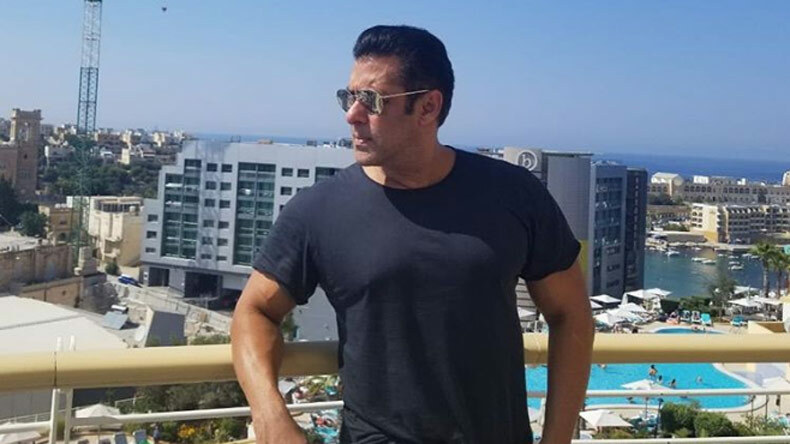 The most eligible bachelor of Bollywood recently took to his Twitter handle to share the detail and shared a classy picture from the rooftop of his hotel in Malta. The actor wrote: “Starting the shooting schedule of #Bharat in Malta, lovely country.” In the picture, Bhaijaan is donning a black t-shirt paired with classy shades. In just an hour, the picture has garnered over 483, 807 likes and the comment section is pouring in with best wishes for his upcoming big venture. Earlier on Thursday, a picture of Salman with his family surfaced on social media in which Salman along with mom Salma and sister Alvira were spotted on Mumbai airport leaving for Malta. As per reports, the first schedule of the movie has been completed and the cast and crew flew to Malta to shoot the second schedule of the movie. Helmed by Ali Abbas Zafar and bankrolled by Atul Agnihotri, Alvira Agnihotri, Bhushan Kumar and Krishan Kumar, Bharat is the adaptation of South Korean film Ode To My Father. Earlier, the movie hit the headlines after Priyanka Chopra took an exit from the movie. While talking on her exit during the trailer launch of Loveratri, Salman said that Priyanka told her that she has got to work in a Hollywood movie and we didn’t want to stop her. He added that the crew of the film got to know about her exit just 10 days before her schedule. “If she does not want to work with Salman Khan, it’s okay; she’s working with a big hero in Hollywood,” ANI quoted Salman as saying.